Learn the distinguishing features that make up this ornate architectural style. 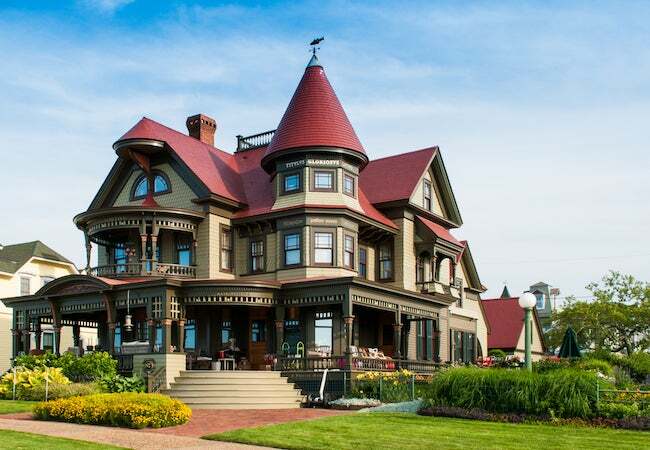 There’s nothing quite like the Revival Queen Anne style of homes that swept through America at the turn of the 19th Century. In fact, their abundantly ornamental exteriors are the exact opposite of “cookie cutter”—each is essentially one-of-a-kind. But, if you’re looking to spot one, they’re hard to miss. You can identify a Queen Anne home, also called a “Victorian,” from a combination of these telltale features. Queen Anne homes stand two or three stories tall, often featuring turrets, towers, and complex roof designs. A large covered porch supported by elaborate columns will wrap around a side of the house. And you’re also sure to find “gingerbread” architectural elements, including hand-carved latticework under the roof eaves and ornate wood balusters on porches. Finally, there’s over-the-top color. Expect painted exteriors in multiple shades, often three or more colors, as well as bright picket fences and front yard flower gardens. Intrigued? If you get the chance, you see one of the best examples of the Queen Anne house—the Carson Mansion—in Eureka, California.